I caught a bit of this on MST3K a few nights ago (God has blessed me with a daughter who loves MST3K and bad movies in general) and knew I had to do something with it. When I found out it was in the public domain, I was doubly determined. This is the story of Dr. Zorka, a mad genius who discovered a radioactive meteorite in Africa and has used it to power all sorts of inventions. Foreign governments are after the meteorite and the inventions, so Zorka’s assistant Dr. Mallory brings in the U.S. Government. Zorka isn’t happy about that and so he plants one of his mechanical, exploding spiders on Capt. Bob West’s plane. Unfortunately, Zorka is unaware that West is taking Zorka’s wife back to HQ for questioning, and though West escapes from the explosion with a parachute, Zorka’s wife is killed. Zorka naturally swears vengeance upon all mankind and decides to conquer the world. Zorka is a great representation of the mad scientist archetype, and has been statted out accordingly. The Devisualizer Belt – Invested with Invisibility – costs 15,000 XP of his science pool. 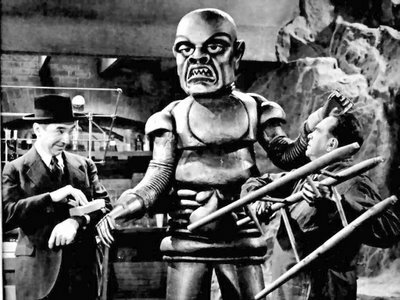 Guardian Robot – As seen in the monster section of the MM! rules. Mechanical Spider – A robot spider that is attracted to a magnetic disc (Locate – magnetic disc only) and then explodes with a poison gas (Sleep) – costs 6,000 XP of his science pool. On the subject of Mystery Men! – I’ve finished my edits and I’m now preparing the file for upload to Lulu. Shouldn’t be long now! Dr. Zorka sounds, and even looks like a Dr. Zarkov ripoff.